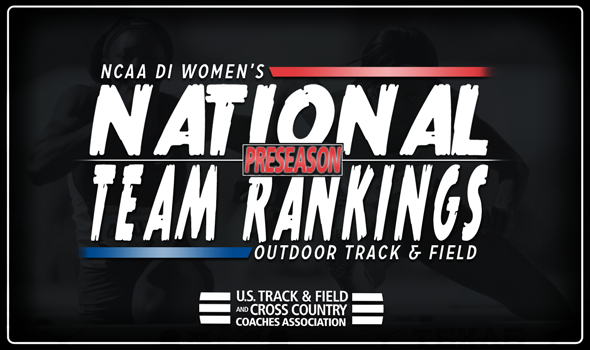 NEW ORLEANS –The NCAA Division I Women’s Outdoor Preseason National Team Rankings show that Arkansas is the team to beat out of the gate, announced the U.S. Track & Field and Cross Country Coaches Association (USTFCCCA) on Tuesday. The Razorbacks find itself in first place for the first time in the preseason rankings in program history thanks to a loaded roster. Taliyah Brooks (heptathlon), Payton Chadwick (heptathlon), Lexi Jacobus (pole vault), Tori Hoggard (pole vault), Nikki Hiltz (1500) and Devin Clark (steeplechase) lead a plethora of talented athletes from Fayetteville into the outdoor season. While Arkansas sits on the throne this week, it will face stiff competition week in and week out from other teams in the top-five. The defending champion Oregon Ducks are in second place in the preseason rankings. Coming off an indoor season that saw the Ducks place fifth, the program will be looking for its second outdoor title in three seasons with a roster that features with the likes of Ariana Washington (100 and 200), Mackenzie Dunmore (400), Katie Rainsberger (1500) and Alaysha Johnson (100 hurdles). Georgia finds itself right behind the Ducks in third place in the rankings. After winning its first indoor title two weekends ago, the Bulldogs’ outdoor roster will be led by jumpers Keturah Orji, Kate Hall and Tatiana Gusin. After finishing just 1.8 points behind Oregon a season ago during the outdoor campaign, the Bulldogs will look to sweep both the indoor and outdoor championships. Southern California sits in fourth in the rankings, giving it the highest preseason ranking since coming in at fourth two seasons ago. Leading the way for the Woman of Troy will be sprinters Kendall Ellis, Deanna Hill and Ky Westbrook, as well as hurdlers Dior Hall and Anna Cockrell. Rounding out the top-five was Texas, which found itself in fifth for its seventh-straight top-10 preseason ranking. The Longhorns stable of hurdlers that features Rushelle Burton ad Ariel Jones will join forces with sprinters like Teahna Daniels that should wreak havoc on the outdoor circuit. Three conferences are represented in spots six through 10 in the preseason rankings. Texas A&M (sixth), Florida (eighth) and LSU (ninth) give the SEC a total of five programs in the top-10. All three programs finished in the top-10 during the NCAA Division I Indoor Track & Field Championships and should figure heavily into the outdoor picture. Kansas State comes in at seventh for the program’s highest preseason ranking ever. With discus thrower Shadae Lawrence, triple jumper Shardia Lawrence, long jumper Wurrie Njadoe, hammer thrower Janee’ Kassanavoid and hepthatlete Nina Schultz on its roster, the Big 12 program will look to finish in the top-10 of the outdoor campaign for the fourth-consecutive season. Stanford comes in at 10th with its second-consecutive top-10 preseason ranking. The Pac-12 squad placed 13th at the NCAA Division I Outdoor Track & Field Championships a year ago, and hope to build on that with the likes of Elise Cranny (1500), Valarie Allman (discus) ad Mackenzie Little (javelin) returning this year.